Soft, powdery, and pink, our unspoilt sandy beaches await your footprints. Here’s your guide to Bermuda’s famous beaches and tiny romantic coves. When visitors step off their plane or cruise ship, many head straight for the beach. Quite right too. We’re blessed a dramatic coastline dotted by a sensational selection of the world’s best beaches. Everything comes together in Bermuda’s beaches: the glittering Atlantic, a glorious, tropical climate, magnificent scenery, and our unforgettable pink sand. This is where the laid-back Bermuda vibe is at its strongest. Popular Horseshoe Bay is named for its unmistakably theatrical shape. This is Bermuda’s most graceful arena where beach-babes and beach-dudes pay homage to the sun. Less crowded, and so much more desirable, is Elbow Beach. Here, the fashionistas, celebs, and jet-setters in-the-know laze beneath ocean-blue umbrellas at the uber-swish Mandarin Oriental Elbow Beach Bermuda. For family-oriented fun, try Tobacco Bay; for snorkelling, hit Church Bay; and for secluded romance, Hog Bay Level is the honeymooners’ favourite. Bermuda’s nature is beautiful and there are some places were it has been kept wild with unspoiled flora and fauna. One of the best parts of Bermuda’s Nature Reserve is without any doubt Nonsuch Island. One of the most northern beaches in Bermuda, Clearwater Beach, is located on the eastern tip of St. David’s Island. For snorkelers around the world, Bermuda is one of the best, if not the best destination. 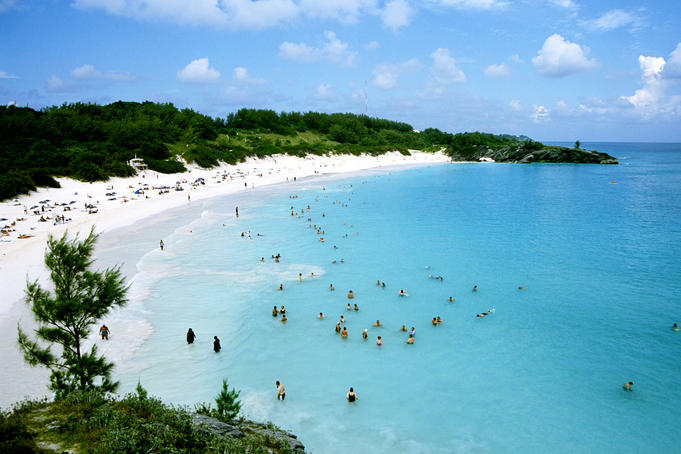 For the locals, Church Bay Beach, in the parish of Southampton, is the best place in Bermuda according to many! Horseshoe Bay Bermuda – A Beach To Definitely Visit!